Ok, this is not CSI or 24 or Bones. All of which would believe fingerprints to be the key to unlocking the case, to knowing for sure who has been there or could this be evidence enough to convict. These days, with all the forensic evidence techniques that are in use, it's only one key piece that can help solve a mystery. Whether a crime has been committed or not, fingerprints are used in a variety of ways. When I was working towards becoming a teacher in Pinellas County Florida schools, it was imperative that a fingerprint/background check be done prior to my being allowed to work in the schools. It was a bit intimidating, especially when I had to have my fingerprints done a few times...because they couldn't get a very good print. These days there is a new electronic imaging technique that is used instead of an ink blotter. They said there are many points on the print that have to be clear in order for the print to be useable or valid. Over and over they would scan my fingers and about the 5th or 6th time it might work. It's still a mystery, but the scanner is apparently very accurate. The details really matter. I've seen little signs at the banks now, you can opt for fingerprint identification on your bank account. This isn't something I'm ready to jump into, but the option is there. Next thing you know, we'll have to be using them at ATM's, at the grocery store, at the Walmart, at the gas station. I'm hoping that's a ways off, but if it cuts theft and illegal activity where our finances are concerned, then bring it on. Closer to home, I remember a moment in time when Michael and I were at a crossroad in our relationship, the discussion was intense and emotions were tender. We were having this discussion at the beach, which we did many times because it was so therapeutic. At one point Michael got up, threw something which had previously been of value into the gulf. I was shocked by this and questioned him on what would prompt him to do such a thing. It was just an object, perhaps the meaning had gone out of it, but I could see no real reason for just throwing it away. So, I got up, took off my shoes and with my clothes still on, dove into the gulf, into the waves to see if I could retrieve it. He was calling for me to come back, that it was useless, we would never find it, it wasn't worth getting drenched over, just let it go. But I told him that it just didn't seem right to throw something like this away. Having it wasn't going to change things now or in the future. It took a few moments, but I think he started to believe it. So, the next thing I see is Michael removing his shoes and shirt, running towards the water. Then Michael prayed, asking God to help us find it, that he was sorry for throwing it away. He petitioned God to somehow redeem this mistake and allow us to retrieve the item from the gulf's sandy floor. After several times of diving in chest deep water, glancing along the bottom and raking through the sand with my fingers we thought it wasn't going to happen. I tried one last time, in a different direction, closed my eyes, went down under the water, placed my hand flat on the sand to feel around, and I felt this object touching my palm. I wrapped my fingers around it, allowed the sand to filter through the water as I pulled it to the surface. I turned to him and held out my hand. He could NOT believe that I had found it. We both knew in that moment, that God had his hand of favor on us and gave us a huge measure of fingerprints to validate our previous discussion. It was a huge miracle that this small object was found on the cloudy, sandy floor, under the water and the waves. It was a huge blessing that God answered that prayer for such a small thing, allowing us to see how big He truly is. We had our miracle, we had our fingerprints. We knew God was present. He showed us in those moments that the past doesn't have to be thrown away, that He, being God, can redeem the past and even restore many times over the hurts that the past can hold. The fingerprint was that God was in the process of redeeming our past, we had to trust that and be open to the possibility that it could be done. Fingerprints have shown us the way along a very bumpy road. On occasion we read them incorrectly, but for the most part we get it right. God has even sometimes left us a handprint or a footprint, which has even greater validation when we are confronted with an issue. The joy wrapped around finding those fingerprints is amazing, we are sometimes literally speechless. It's so easy to go from hope-less to hope-filled in the blink of an eye, all because of a fingerprint. In our case, Gods fingerprints left for us to find tell us a few things: 1) we're in the right place, 2) we're going in the right direction, 3) we're making the right decision or 4) we are being blessed simply because He wants to bless us. And as fingerprints are, each one is unique to the moment. Affirmations are very powerful and God seems to know when and where to interject them into our path. The painting above is the second of three that I acquired from Melody Hogan. This heart with fingerprints jumped out at me because it is so significant. Michael and I, from day one, have asked God for fingerprints on our relationship. And God has never failed to show them. 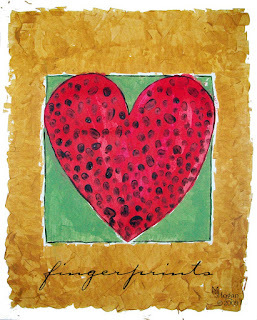 This illustration of fingerprints on a heart shows me that of all the fingerprints to find, the ones affirming love are the most precious. That's why there are so many. God doesn't just give us one and stop. If we allow Him, he will always leave us fingerprints of affirmation on all our actions and our direction in life. Right now, I'm waiting for the next big fingerprint....because it's coming. The waiting is hard. Perhaps it's better said this way - 'not knowing what to do while we're waiting' is hard, that would be more accurate. Regardless, I guess the only thing to do is keep dusting for fingerprints. They will be there when we need them, this we know for sure. I'm a Photographer of beauty as I see it! Just Simply - Now OPEN!! Attacking Life - or Attacked by Life? Copyright Debbie Daniele 2017. Travel theme. Theme images by tjasam. Powered by Blogger.